Quickly converts Unicode format to ANSI format without size limitation issues. Save Converted PST File into the desired location in the system. Convert all the Mailbox items including emails, contacts, notes etc. Support Batch Conversion of PST File, Convert multiple files at once. MS Outlook is required to perform the conversion in PST Upgrade tool. 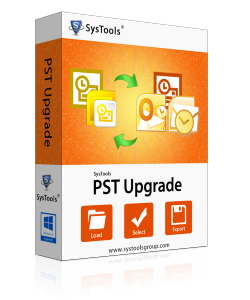 PST Upgrade Tool freely Upgrade ANSI Format to Unicode PST format without any data loss from PST File quickly. Also store converted file in desired locaton in the local system . Software provides options to add multiples pst files to convert at once, You can also a folder storing PST Files to convert altogether. Use remove button to remove any PST file. Software supports Large PST File to convert from UNICODE to ANSI PST format or vice versa. No corruption issues arises during conversion of big PST File. Follow simple steps to convert UNICODE PST file to ANSI PST format or Vice Versa. You can also create a new folder to store newly converted file or store in local system. 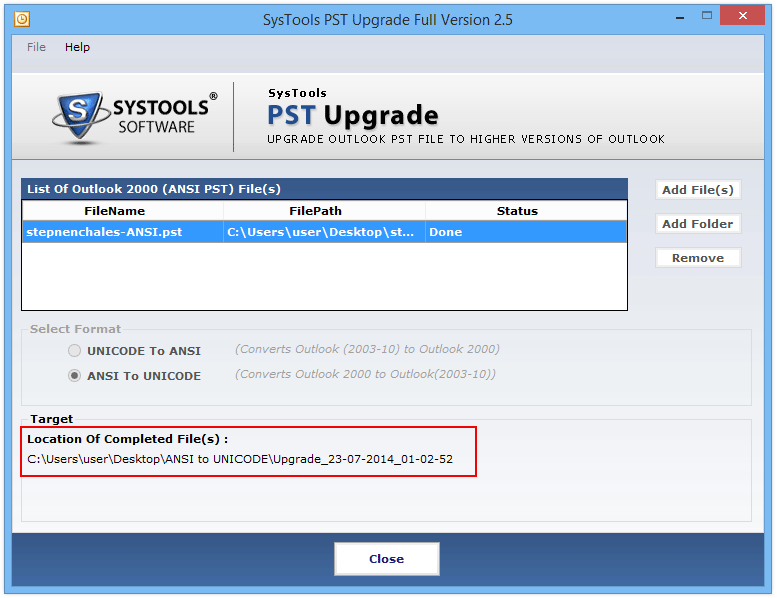 PST Upgrade tool Support both format of PST such as ANSI & UNICODE. Software genrates an alert message, if user trying to upgrade PST Unicode format file & downgrading ANSI file. PST Upgrade Software – A Close Insight! 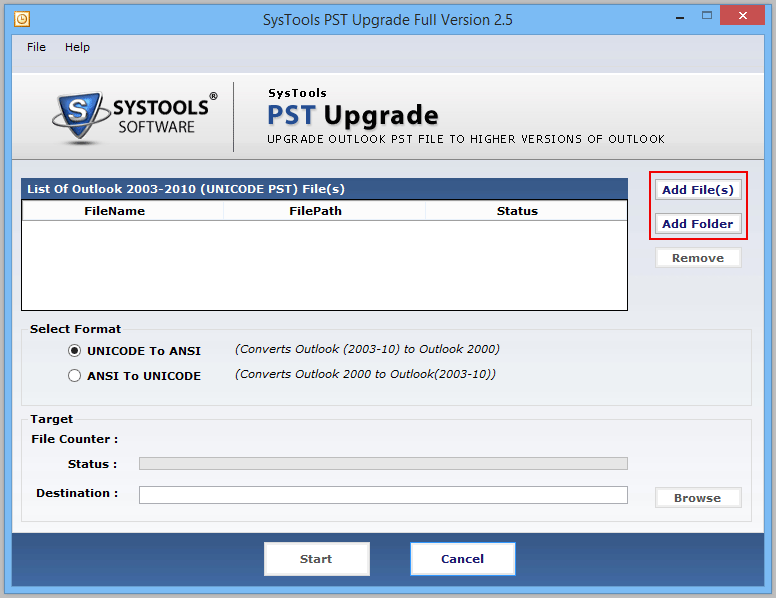 A PST Upgrade Tool designed to Upgrade the ANSI Format to UNICODE Format, so that user can view all Email, Contacts, Calendar, Notes, and Journal details into New Microsoft Outlook Edition. 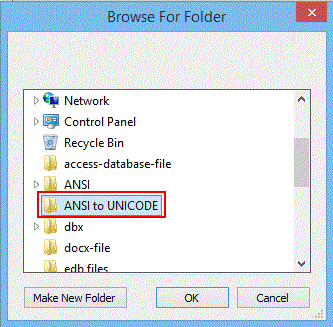 A user can also use an option to Downgrade UNICODE Format to ANIS format according to their desired need. 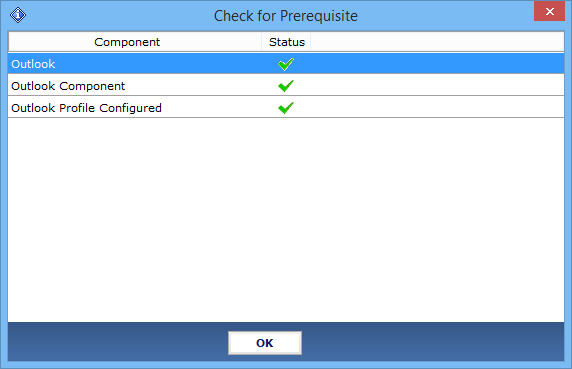 To complete the procedure Outlook installation is necessary within the system. 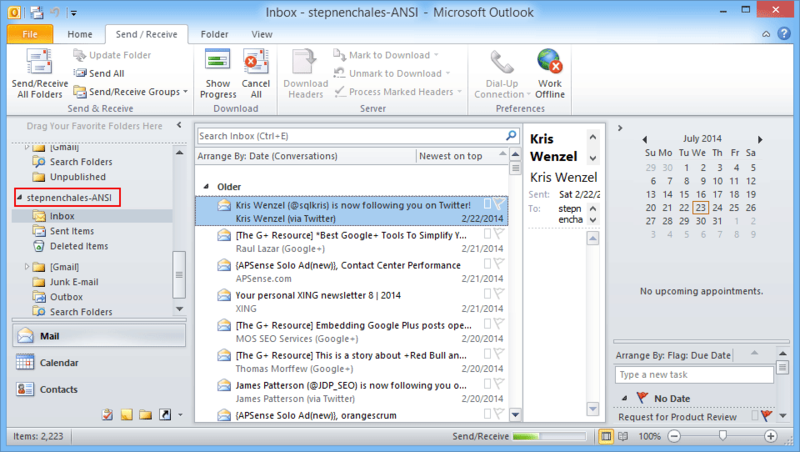 Since Two formats are used by Outlook Application to store data of Outlook Application, ANSI and UNICODE Format. An ANSI format used in earlier 2003 Outlook Application and have the capacity to store emails and other information is around 2 GB Size, But After Outlook 2003 Edition and Outlook stores information in New File format Called UNICODE format and the size of this file format increased and today size of File is around 50 GB. Since people are still using OLD ANSI format to stored Outlook data and need to convert into NEW UNICODE format, So that they can view their OLD data in UNICODE format. Download & Run ANSI to UNICODE Converter. Tool check the Prerequisite component. ADD File: To select specific PST File from the local system, click on ADD file option. ADD Folder: To select folder of PST Files, Click on ADD Folder option. Browse the location of PST File within the system load file within software. Select location to save the resulted Upgraded or Downgraded PST File. You can create a new folder using Make New Folder option. Select location, click OK.
Click on "Start" button to start converting PST file to ANSI & Unicode PST file respectively. Click on OK button of Window interface having a message of Complete conversion of PST file in the desired format. Now Click on the Close button. 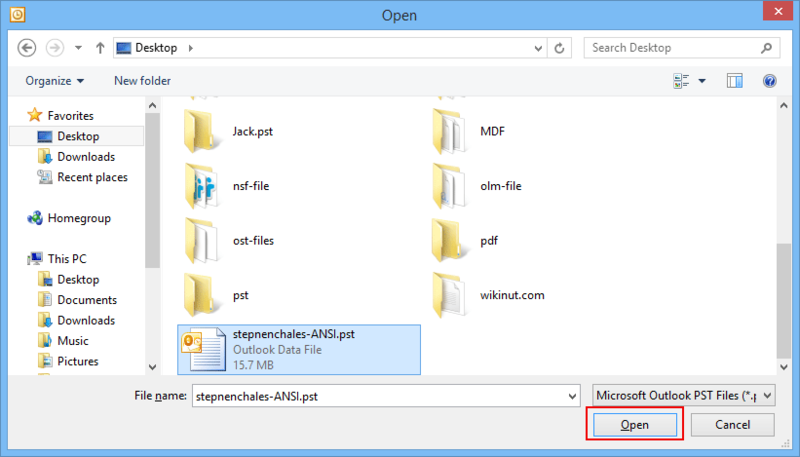 Open Microsoft Outlook, Go to File Menu » Open &s Export » Open Outlook Data File. Now view your Emails, Journals, Inbox, Contacts, Calendars details in UNICODE to ANSI format or Vice versa. PST Upgrade Tool- Replies All Doubts & Queries! Is Outlook installation is required for proper functioning of PST Upgrade software? 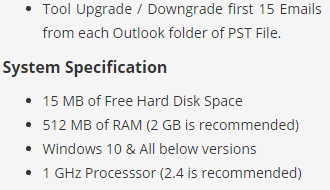 Yes, Outlook installation is necessary to use PST Upgrade tool. 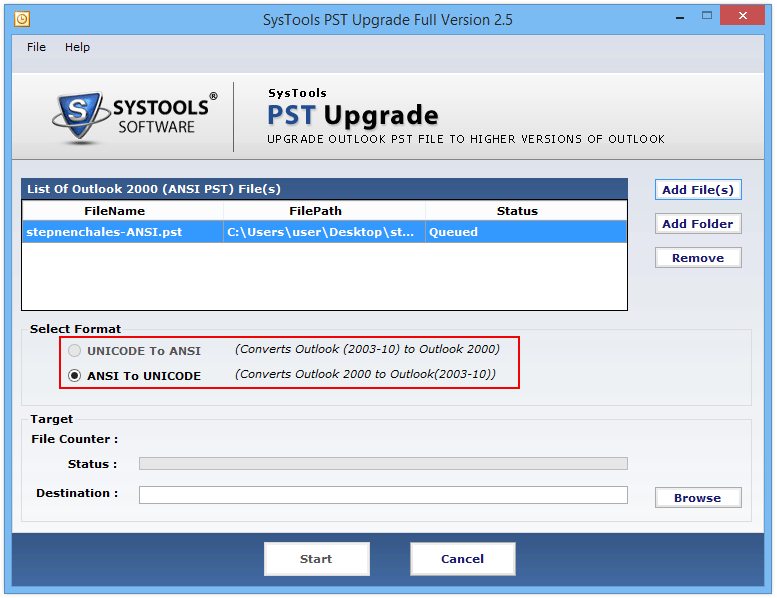 Outlook 2003 or above version should be installed and configured properly while upgrading PST from ANSI to UNICODE format or vice versa. Is PST Upgrade Tool will remove the corruption of PST file? How many PST files can I upgrade from ANSI To Unicode? You can upgrade multiple PST file at once. To upgrade many files, you have to select the add file option. A user can also select folder holding multiple pst file by ADD folder option..
Best tool to Upgrade or Downgrade the format of Outlook PST. As Tool include both features change format of OLD ANSI format to NEW UNICODE format and also new format of PST to OLD PST Format. To Convert ANSI PST to Unicode format, try the PST Upgrade tool to verify whether tool work or not. Tool Upgrade my move data to the new Unicode format of PST smoothly. Completely satisfied with the amazing features of the software. Great Utility tool to upgrade ANSI format of PST to UNICODE Format! A recommended Tool to Upgrade PST files for windows. Thanks to the developer team. While working on some Project, got an old version of PST File and need to convert the file into a Unicode format so that I can view the details of the file in my Outlook application. Tool help me to convert old file into a Unicode format to view details.